Acorn squash along with other squashes are fall and winter vegetables and I cook with them often as soon as summer is over. I do however like to use squash as a “container” and stuff it with various grains and vegetables and I can do that any time of the year. Being the starch lover that I am, I can never have too much starch (read The Starch Solution by Dr. John McDougall). Acorn squash is nice for stuffing as its shape lends itself to serve as a bowl. I cut the squash in half, drizzle with butter and sprinkle some brown sugar and roast the halves until the flesh is tender. When ready I fill it with the already made quinoa mixture and warm it up before serving. 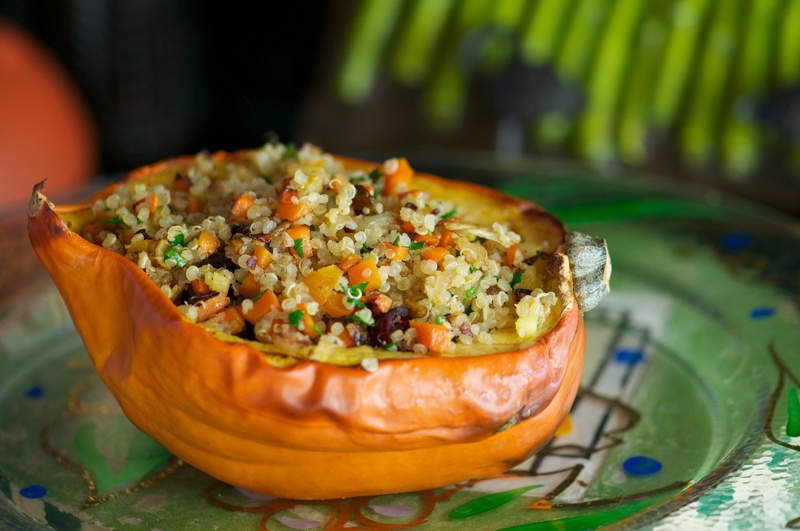 You scoop out the roasted squash flesh as you enjoy the quinoa filling. The components of this dish can be prepared in advance and then assembled and reheated before serving. What could be simpler? Cut each squash in half lengthwise (through the root and stem ends). 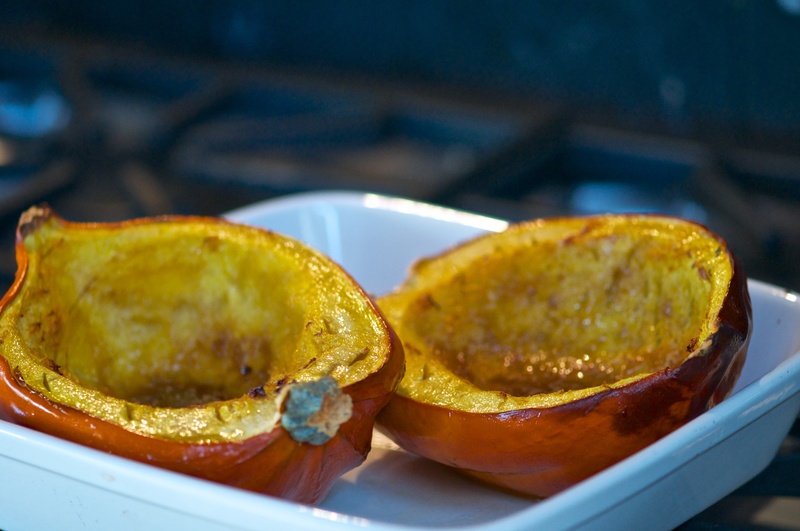 Drizzle the inside of each squash half with melted butter and sprinkle the brown sugar over. Place on baking sheet and cover loosely with foil. Roast in 400℉ for about 30 minutes or until cooked through. Insert a knife into the flesh to check if it is done. There should be no resistance. Towards the end of the cooking remove the foil sheet and let the squash halves begin to brown but do not let them burn. When cooked through remove from oven and set aside. Heat olive oil in a large skillet. Add onion and cook until soft and fragrant but not brown. Add carrots and celery and cook about 3-4 minutes to soften. Add cumin and ginger as well as salt and pepper and continue cooking until vegetables are tender but not mushy. Add chopped dried fruits and mix. When vegetables are cooked through add the quinoa, just enough to make a nice looking stuffing. You don’t have to use all of the quinoa if it seems too much. Keep the rest of the quinoa and have it as a breakfast cereal. Add parsley to the quinoa mixture and mix it in gently over medium heat until heated through. Remove from heat and set aside. When ready to serve stuff each squash half with the quinoa stuffing and warm up in the microwave or cover and heat up in a 350℉ oven until heated through. Serve on its own or alongside other dinner items. Don’t forget to scoop out the roasted squash’s flesh. It’s deliciously sweet. Note: to cook the quinoa bring 2 cups water to a boil, add 1 cup quinoa and stir. Reduce heat and cook, partially covered, until water is absorbed and quinoa is cooked through. Remove from heat and set aside for 10 minutes, partially covered, then fluff quinoa with a fork and continue with the recipe. 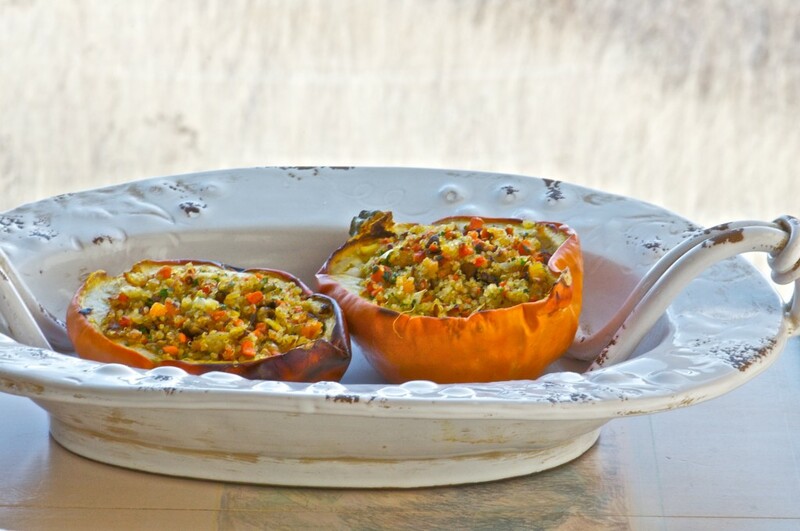 I love acorn squash and enjoy trying Quinoa in a variety of recipes . This one is tingling my taste buds already. Can ‘t wait to try it! I love the whole idea and presentation of this dish! I am definitely going to get a lot of mileage out of this one! Thanks Marilyn, it’s our kind of food, I know. Love the squash bowl to display its contents such an enticing dish with dried fruits, quinoa and ginger, looks delicious on this rainy cool day! Thank you Dori, yet again. I know, it looks like fall outside and squash is a fall veggie but when you are a vegetarian you use what you can. I am just baking chocolate cream cheese brownies. If they work out well and photographs well I will post it later. Thanks again for visiting.